This is a guide for obtaining the One Too Many achievement/trophy in the Black Ops 3 Eclipse DLC map Zetsubou No Shima. One Too Many - In Zetsubou No Shima, throw up. To obtain this you must eat a fruit from a plant. To grow a fruit you have to water a seed with Blue, Purple, and then Green water. You can water a seed once per round and it must be in this order. After the plant is grown it only has a chance to bear a fruit, so it's recommended to plant multiple seeds at the same time to increase your chances. 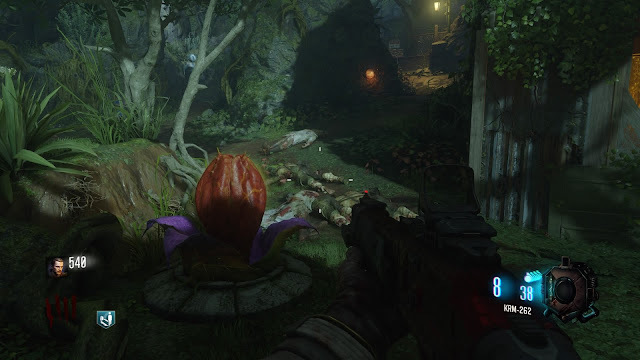 Once you get a fruit you can eat it for a chance to throw up or have 4 perks equipped and you will be guaranteed to throw up as the fruit won't give you a 5th perk.